Thanks to my old man doing his best, despite it being on a two-generation housing loan, I was able to get my very own single-family house! As I went shopping on the evening of the day I moved in on my younger brother’s request, I was asked for help by a lovely blue-haired girl. Told it was a kidnapping, I took out the perpetrator with a lariat, and what appeared were actually two large eggs. As soon as I touched them, they split and two baby girls appeared! Right... I can deal with a shut in MC who can't talk to girls (he is 17 and not home schooled so I really do wonder why he acts like he does), but the story feels like it was written as a school project or as a hobby by a younger teen. With a whoosh, I approached the person within the dissipating cloud of dust. I do support newer writers, but this is not something that I would read for fun. This novel is really all over the place with the first few chapters. It's different perspectives in different times and none of it really makes any sense. I hope the future chapters are more cohesive, but right now it's like reading the ramblings of a child trying to put a story together and being told it doesn't make sense so he tries to fill in the blanks and gets even more confusing in the process. First of all, forgive my writing, I am not English speaker. at the moment, the other girls around have been irrelevant, I hope it continues like this. Nothing much to say. 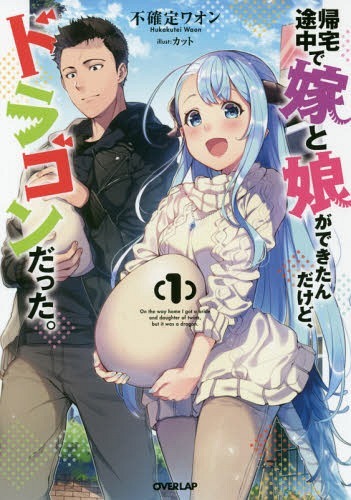 Just another harem comedy novel, with potential yandere eyeing the wife position currently held by clingy dragon waifu with zero common sense, while several other chicks hang around making up the typical harem comedy of errors. The indecisive MC who can barely speak his mind without being bulldozed by all the girls around him is basically just icing on the cake at this point. A cake that we've all probably seen a hundred times over. The twin babies are new though, and reading about how they take care... more>> of the babies, and dragon physiology in this book is mildly interesting, but not enough for me to care about a stuttering MC who keeps blushing and can't give a straight yes or no. I do not have much to say about this novel, in general it is good, the protagonist is what it seems (a rebellious average teenager with average intelligence) and as far as I remember is not hetare (with only this is 5 stars). Regarding the harem, in the 50 chapters that I have read there is still nothing romantic beyond what is being developed between the two (MC - Dragon), so it implies that the harem will not appear from nowhere and without development. Basically I consider the novel as "good", in... more>> the sense that it has almost nothing that "personally" makes me stop reading it... well, only one thing, . The family of the MC is annoying. Close to chapter 50, the male protagonist's father and brother basically lecture him after a drama with the mother of the dragon girl (in which she almost kills who is supposed to be respectively his first son/older brother three times) and reproach him for striving to be a good father (! ?, that's what I understood), in spite of not being the moment for said situation, since this is moments after the drama with the mother dragon and whose drama left her daughter in an emotionally wounded state and the MC with fractures. So far, as of ch 5, not much has happened. The chapters are rather short, but the translation seems a-okay so far, and the premise is nice. I'd say it's one of those you put on your to-read and wait a month or two for a healthy buffer to catch up with.